IDW Publishing, a division of IDW Media Holdings, is proud to announce that Disney Publishing Worldwide honored them with their prestigious Best New Licensee Award at the Bologna Children’s Book Fair 2018. 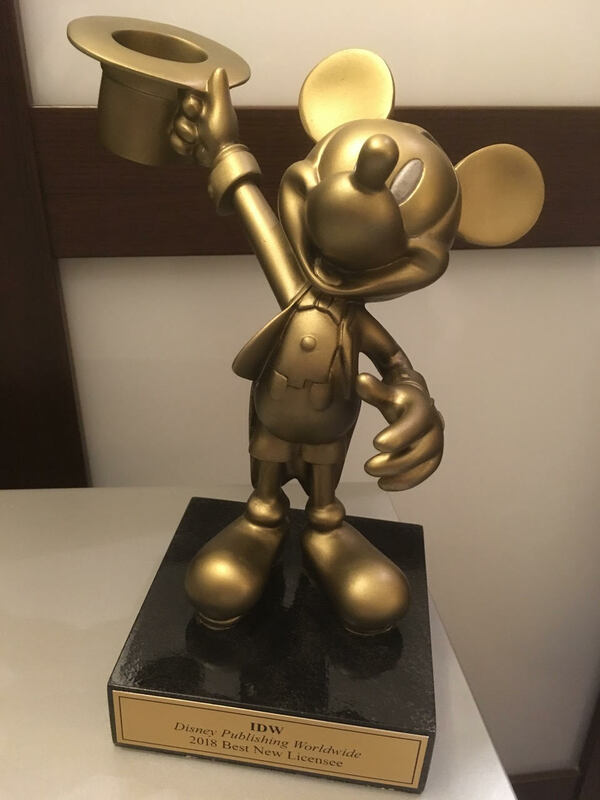 The Best New Licensee Award is given to a new Disney Publishing Worldwide licensee signed in the past year, who created a new format and brought new distribution into the marketplace. In 2017, IDW began publishing an all-ages Star Wars comic, Star Wars Adventures, in addition to their Disney titles. Star Wars Adventureslaunched as a fan favorite in September 2017, and quickly gained notice by the industry; Diamond Comic Distributors acknowledged the title’s sales achievement with two GEM Award nominations in the categories of Best New Comic Book Series and Licensed Comic of the Year. Have you been reading the Disney books from IDW? Let us know which books are your favorites in the comment section below. Also, don’t forget to Like, Share and Subscribe to all things Constant Collectible so YOU can keep up to date with all the news and reviews from a world of GEEK CULTURE.